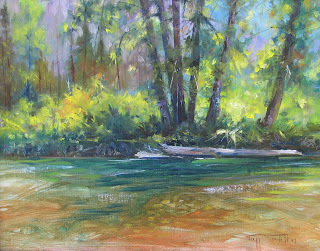 Thoughts on painting, "En Plein Air"
I've painted, en plein air, from Maine to Washington state. I've stood on the dock painting lobster boats as they came in from lobstering and traded paintings to lobstermen for a sack full of lobster. Parked on the roadside painting landscapes of the Rockies or Wallowas, folks stop, look over my shoulder and take photos of me painting the landscape. We trade email addresses and they send me photographs, sometimes we trade paintings. Whether painting on the side of the road or the wilderness, the thing I like about plein air painting are the 'Paintouts'. Paintouts have become a popular way for galleries, festivals and communities to ramp up the exposure to art. Such events are an opportunity for artists to meet other artists and compare their work. Galleries and community art festivals get an opportunity to showcase their local artists and invite outside artists, sometimes of great stature, to their community, which can be a great economic boon to all parties. Artists are invited to "paint the town", after a day or two, paintings are collected for a show and reception where the work is displayed, and awards presented. It's a great way for art to bring artists and the public together. The public gets to see artists at work and are thrilled to find ordinary scenes brought to life by gifted painters. Artists have always turned to nature for both inspiration and knowledge. The Impressionists made a practice of working directly from nature. Today painting "en plein air", literally, painting "out of doors", has become something of a movement along with an interest in "daily painting" in which painters challenge themselves to do a painting a day. Google 'daily painting' and you will find blogs and websites displaying extraordinary galleries of artwork. Many of these pieces are available directly from the artist or sold at auction on Ebay for very reasonable prices. Painting 'en plein air' fits our busy lifestyle. In an abbreviated world of acronyms and sound bites, small quick paintings done on the spot, are only appropriate. It is the artist freezing a moment of time, focusing like a Zen master and deriving inspiration from an intense reflection upon nature, like haiku poetry, distilling the moment into it's essence. A process where the heritage of the Impressionists meet the oriental art of Zen masters. Much has been written about the Impressionists' interest in oriental prints. I think they were as interested in the process as much as the product. Untill Monet and the Impressionists took painting out of the atlier and Salon into the streets and forests, official art was considered to be work done in the studio. 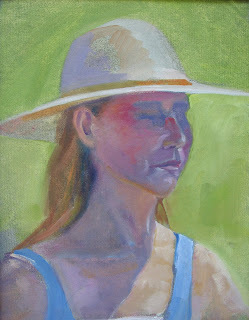 To consider work done "in the moment", on site, en plein air, was revolutionary. We can thank Monet for elevating everyday scenes to the extraordinary and bringing art to the common man. Painting was no longer an activity for the affluent but something anyone could do. With the advent of paint in tubes, artists developed a portable studio. The french easle and pochade to carry wet canvas, became synonymous with the image of the artist at work. It is a privledge to make a living as an artist but it is also a job that puts bread on the table. Like a carpenter or plumber, doctor or dentist the artist and his tools find work enhancing our lives and culture, turning the mundane into the thing of beauty to be appreciated in our busy hyphenated lives. The show in Spokane at the Kress Gallery went well. My friend Slatz was the guest poet and hushed the crowd with his wonderfully embellished poetry. Quite appropriatelly Slatz read from his suite of poems titled "Seasons" which went well with my series on the wall behind him titled "Seasons". To be honest, we didn't plan things this way but the collaboration started 30 years ago with myself playing guitar behind Slatz. I look forward to more such opportunities. Perhaps it would be appropriate to organize a political fund raiser with all such artist types. After all it is an election year. Artist should let their candidates know what they think and ramp up the support for the arts. Thanks to Mapplethorp for blowing the government off with his explicit photography, politicians are allergic to the political risk of supporting art and the results are a culturally impoverished public art world. Ryan Hardesty manager of the art@work program who hung the show and did an exceptional job. It was great to see my work all in one room. 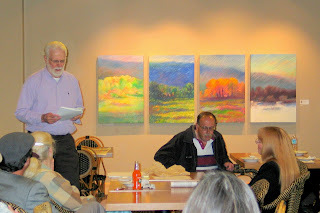 I had over 30 plein air paintings which just filled the room. Ellizabeth Mills, manager for Riverpark marketing department helped make the show possible. Luna's catered the event with wonderfully creative treats. I greatly admire the art@work program that the Northwest Museum of Arts and Cultures. Paintings can be leased with the rental going towards the eventual purchase of the piece or the piece can be returned and anther tried on. A great deal for artist finding a home and income for their work and a way for new collectors to get started. Thanks to all who attendende and for those of you that have the opportunity the show will be off for a couple months at Riverpark Mall.